Japanese beetles are found in many parts of North America, particularly in the eastern half of the continent. If you don’t have this pest chewing on your plants, consider yourself lucky. These insects spend about 10 months of the year underground as white grubs that live in the soil in a curled C-shaped form. The grubs feed on plant roots, especially lawn grass roots, and they can damage your lawn if their population is heavy. About 15 grubs per square yard is considered heavy. The winged adults have distinctive metallic green bodies and they begin to appear in midsummer, usually toward the end of June. They are active on warm, sunny days over a six-week to two-month period. They feed on some perennials and trees and shrubs (mostly those in the rose family), but they are most often found on roses, where they eat both the flowers and the leaves. 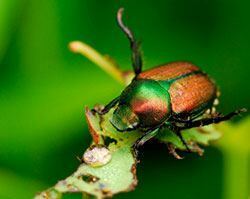 The beetles come in large numbers and can ruin the appearance of a rose bush in no time at all. Extremely dry summers interfere with their reproduction, so letting your lawn go brown in a drought can be helpful. Birds (especially starlings) feed on the grubs and, less desirably, raccoons and skunks dig up lawns to get at them. Manual control: You can knock the insects off plants and into a container of soapy water early in the morning and at dusk, when they’re too sluggish to fly, but you have to do this regularly during the weeks the adults are active. Beetle traps: These attract the insects with bait that either copies the scent of female beetles, thus attracting the males, or a food lure that attracts both males and females. However, horticultural research has shown that the traps tend to attract more beetles than they catch, which means that vulnerable plants nearby can suffer more damage than if traps and baits are not used. Biological controls: Milky spore (Bacillus popilliae) are naturally-occurring bacteria that infect and kill beetle grubs in the soil. Milky spore is harmless to people, animals, other insects and plants and is available in a powdered form in the US (but not in Canada). Unfortunately, it’s not very effective in heavy clay soil. Alternatively, parasitic nematodes, microscopic roundworms that lay their eggs on the grubs and kill them, can be applied. Nematodes come in a powdered form that is mixed with water and sprayed onto your lawn. The ideal time to do this depends on where you live, so read the directions carefully. Nematodes are most effective when conditions are warm and moist. Chemical controls: Lawn care services offer grub control with Merit insecticide (imidacloprid). Merit is applied to lawns in July to help destroy grubs soon after they hatch. 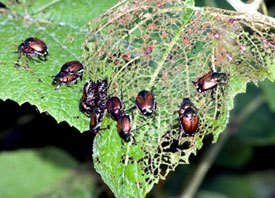 Spraying the beetles with a pyrethrum-based insecticide or one that includes insecticidal soap and pyrethrum can protect the foliage and flowers of affected plants. Unfortunately, these products, while organic, can also kill bees and other beneficial insects, so spray at dawn or dusk when honeybees and other flying insects are less active. Begin spraying as soon as beetles appear before they can do too much damage.